Hello everyone! The Trendy Twine Design Team is introducing the new Batty Sequins today!! Sequins, along with Trendy Twine, are something I use all the time. 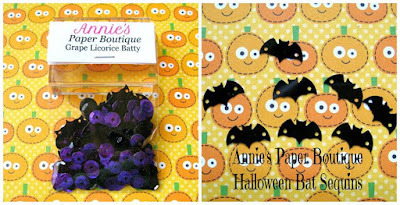 And I just love having some fun Halloween sequins to use. I got to use the Grape Licorice Batty Sequins along with the fabulous Grape Licorice Trendy Twine. I also made my first ever shaker card. 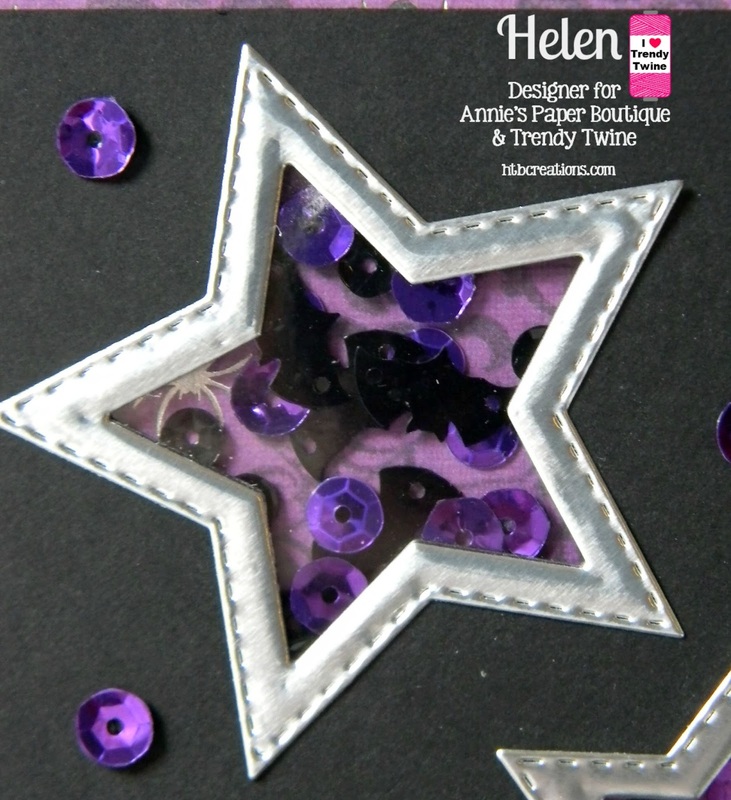 The sequins are in the star shapes and then I also used some on the card and sentiment tag. I learned a lot about making a shaker card and the number one thing is to get different foam. I used some clear pop up dots which seemed like a great idea, but foam tape that I can cut down will be much better next time. Now, be sure to head over to Twine It Up! with Trendy Twine and make sure to visit everyone's blogs--they have some amazing projects to show you today!! Plus, there are two other sequin mixes that you just need to have. Visit Annie's Paper Boutique to get these fun sequins!! 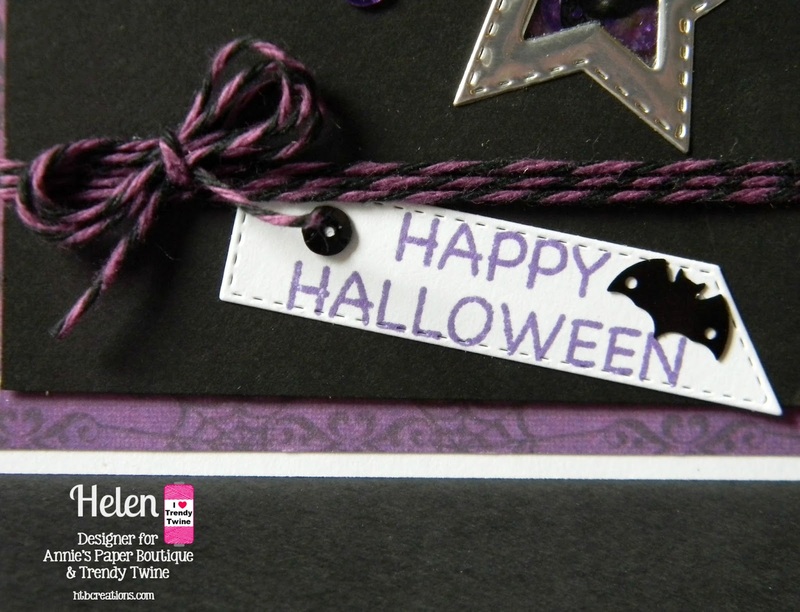 You did a great job on your card, Helen! I thing the colors you used are so classy and perfect. Have a wonderful day! Super AWESOME card Helen!!!! Love how you showcased the sequins!!! Gorgeous card!! 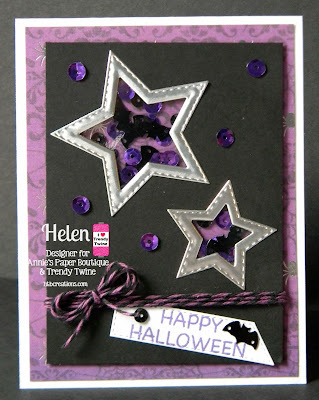 You know I just love all the fun purple and those cute stars!! Such a FABULOUS & FUN card Helen!! You did an AMAZING job !! Perfect! I love the stars and the whole layout! Perfectly fun and composed! So super cute, those stars look awesome! The color combination is fabulous too! Helen, this is a fabulous card. Love the stars and the color combination is so pretty. You did a great job spotlighting the sequins and twine. So fabulous! I love your stars! Gorgeous colors!